You are a citizen or eligible national of a Visa Waiver Program (VWP) country. The Electronic System for Travel Authorization (ESTA) can take up to 72 hours to be approved and gives tourists entry to America. Airlines have warned that they will not allow passengers to board flights who have failed to fill out the online form. The electronic approval replaces the green cards that passengers used to be given to fill out on the plane before landing. Most passengers will receive approval within minutes of filling out the form, but it advised that everyone apply 72 hours in advance. Once the ESTA has been approved it is valid for two years and can be used for multiple entries into the US. The new online entry application applies to about 34 other nations with US ‘visa waiver’ status. The quantity of websites charging to help tourists apply for their ESTA is causing confusion, particularly as they are often listed above the official website in internet searches. 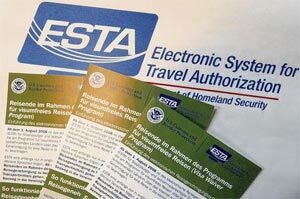 The fee for the use of the ESTA system is comprised of a Homeland Security fee of $10.00 for each VWP applicant receiving authorization to travel to the United States and $4.00 for the processing of the ESTA application. Applicants who are denied authorization to travel to the U.S. under the VWP will only be charged $4.00. The fee may only be paid by credit card.